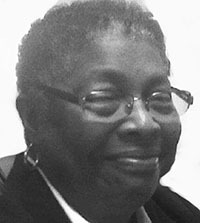 Augustus Funeral Home regrets to announce the passing of Ms. Cheryl E. Eve. A home-going service for Ms. Cheryl E. Eve, loving mother of Jonathan Eve [Keisha] and Tracey-Lynn Salaam [Jamal]; grandchildren, Jair and Jekai Eve and Solomon Salaam, sister of LaVerne Furbert [Eugene Coddidngton] and Maxine [Furbert] Esdaille in her 75th year of 23 Verdmont Valley Drive, Smiths will be held at the First Church of God, Pembroke Today, January 19, 2019 at 11:00 a.m.
Interment will follow the service at St. Mark’s Church Cemetery, Smith’s Parish. In lieu of flowers, please make donations to the L.C.C.A. Social Services, Charity No. 87, Suite 211, International Centre, 20 Bermudiana Road, Hamilton HM 11. Relatives and friends may pay their last respects at The First Church of God, Pembroke, Today, January 19, 2109 from 10:00 a.m. to 10:55 a.m.
Lovingly remembered by nephews: Vance [Vanita] and Dr. David [Basira] Chapman and Omari Esdaille; great-nieces and nephews, Morgan Allen Chapman, Asante and Judah Chapman, Xavier Ramsay, Zen Joseph, Jahdari and Jahmaya Chapman, Kiemari and Sorayah Esdaille; Aunt Coralita Darrell; Cousins Vaughan Fubler, Edwin Darrell [Kay], Glenn Fubler [Deon], Gilbert Darrell Jr., Miriam Smith [Graham]; Dr. Eva Hodgson, Grace Swan, Arthur Hodgson; Janet Lambert [Goodwin], Kay Williams [Warren]; very special friends, Bishop Vernon Lambe and Mrs. Ruth-Anne Lambe, Leonie Curtis, Esme Williams, Helen Mateen, Charles and Juneia Jeffers, Verna Dickinson; the First Church of God family, the Verdmont Valley families, Jeremy Johnson Jr., Wendell and Rose Eve, Nina Webb, godchildren Andrea Ratteray, Lisa Holder and Sabrina Richardson, and numerous other relatives and friends.